We are so excited to share an incredible new resource with you: The Good Beginning, an online registry for donating to charitable causes throughout the world. Many couples are looking for alternatives or additions to traditional registries and The Good Beginning is just that: an easy-to-navigate giving registry where your guests donate to the causes you care most about. A place where couples begin their marriage by doing good. If you don’t have a tie to a specific organization, start by doing a bit of research in a cause that pulls to you. Maybe it’s arts and education or maybe you care most about helping communities rebuild. And if you’re still not sure, browse The Good Beginning's featured charities to learn more about some of our favorite organizations across the globe. If you know the charity you want to register for, but don’t see it on the site, its simple to add it here. Once you’ve decided on a charity or three, simply register by entering your name, wedding date and email. From there you will be able to enter up to 5 charities to sponsor for your wedding registry. That’s it. You’re set up. 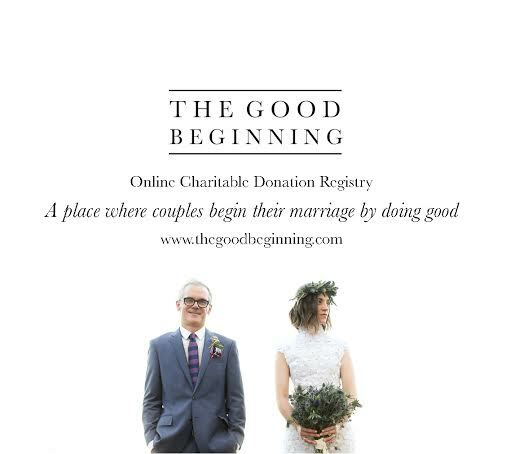 Once your registry is in place, you will have a direct link to embed in your wedding website for your guests to click direct to your registry, or simply direct them to www.thegoodbeginning.com and they can search for you by name. As donations come in each donation will be tracked in your registry. Every person’s gift including name, amount and organization will be disclosed to you so you can send thank you cards. So cheers to beginning of The Good Beginning... we're all for streamlining the process for couples and guests to give back.